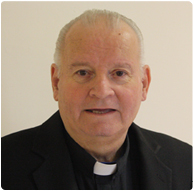 Redemptorist missionary, Father Pierce John Kenny, remembered as a dignified priest who never lost the common touch, died on June 25, 2012 at St. Joseph’s Hospital in Towson, MD under the care of his religious confreres at St. John Neumann Residence, Stella Maris in Timonium. Father Kenny was born on November 28, 1943 in Brooklyn, New York, professed his first vows as a Redemptorist on August 2, 1963, and was ordained a priest on June 22, 1969. After graduating from the Redemptorist Preparatory Seminary in North East, PA in 1962, he made his novitiate year in Ilchester, MD, and received his B.A. in philosophy from St. Alphonsus College in Suffield, CT in 1966. After completing his graduate studies in theology at Mount Saint Alphonsus Seminary in Esopus, NY, Father Kenny served on the foreign missions in South America at Telemaco Borba, Parana and Bela Vista. He returned to the Baltimore Province as vocation director from 1974 until 1978 and was then appointed to St. Gerard’s parish in Lima, Ohio. The following year he returned to the then Vice-Province of Campo Grande where he worked for six more years in Ponta Grossa and Paranagua. June, 1986 found him stateside once again in Brooklyn for a year and then for the next five years at St. Clement’s Mission House in Ephrata, PA. In 1992 he was transferred to St. Clement’s Parish in upstate New York at Saratoga Springs where he served until June 15, 1998 when he returned for the final time to his hometown. He remained a member of the OLPH community in Brooklyn until his death fourteen years later. 7 p.m. to 9 p.m. with wake service at 7:30 p.m.